Is it possible to keep the essence of Burlingame intact, in the face of rapid change? Periodically over the past several years, our newsletters have informed you of various contemporary events and developments that are history in the making. Some change is deliberate and calculated, following current regional trends in city-making, while other change can result from accidental twists of fate. What is clear, however, is that the Burlingame we know today may look a whole lot different in the future. 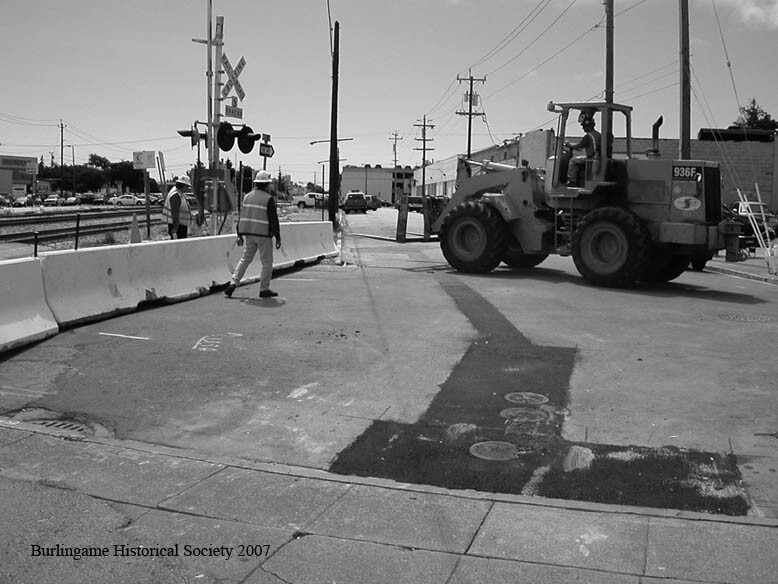 In June 2007, following long negotiations with Burlingame to mitigate negative impacts of permanent road closure around the Burlingame Railroad Station, South Lane at Burlingame Square was closed for good and with it, access over the tracks. 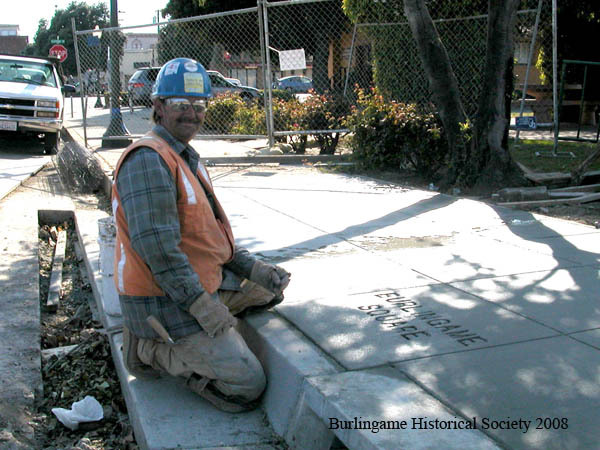 The Burlingame Historical Society worked with Caltrain’s contractors to make sure the original, albeit damaged “Burlingame Square” concrete slab imprint was restamped in new concrete, exactly in its old location- one of three imprints still in existence on the Square. City Council members, including two longtime Burlingame Historical Society board members, worked hard to make sure the new landscaping and shelter construction on the platforms reflected the history of the station. Just a few years later, with the passage of Proposition 1A, plans for electrification of the railroad morphed into a controversial Caltrain agreement with the High Speed Rail Authority to share tracks on the SF Peninsula line between San Francisco and San Jose, the affects of which Burlingame will likely experience into the future. Further north, the aging Broadway overpass (1947) is currently under reconstruction by Caltrans, having been in the queue, so to speak, for about 20 years. The new iteration of the structure will be constructed several feet to the north of the old ramp, and will be several lanes wide for vehicle stacking. The Broadway train station has been closed to weekday service since 2005, yet the railroad crossing remains one of the most congested and dangerous around. A funded study is underway in the community to discuss concepts for grade separation solutions for the future, though such a project could take many years to fund and come to fruition. 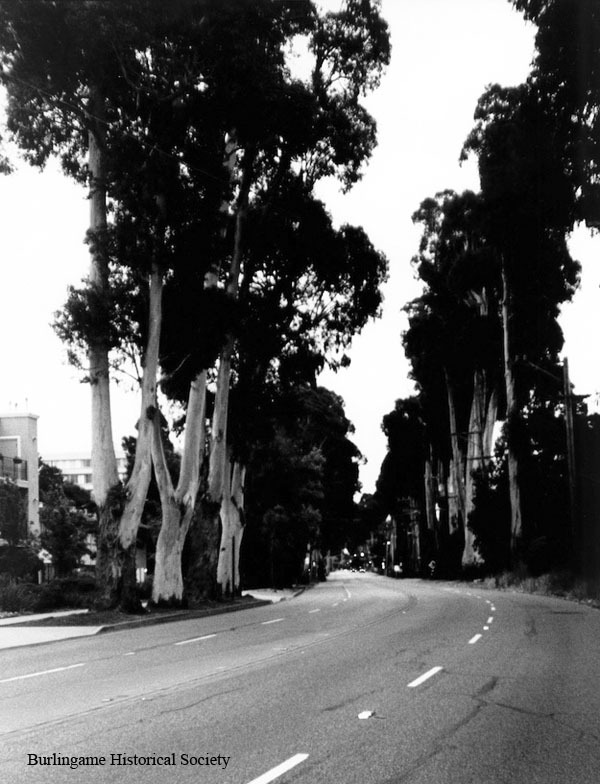 In 2012, the Howard Ralston Tree Rows on El Camino Real were added in the National Register of Historic Places. In a theme that has replayed dozens of times over the past century, the most recent attempt by Caltrans (2013-2015) to widen a segment of the historic highway in the vicinity of Oak Grove and Floribunda in order to create dedicated left-turn channels, has stalled, likely due to the less than enthusiastic public and city response to obligatory tree removals. The longterm health and monitoring of the heritage trees, along with the goal of steady rehabilitation by replanting, maintenance and hopeful survival of new replacement elms presents a fiscal challenge, but one that needs to be addressed if Burlingame is to retain its leafy, character defining historic highway into the future. In a process that will evolve over the coming year, community talks are underway to replace the aging Burlingame Recreation Center, constructed in 1949 (on the former Gunst Estate) with a new structure. The new center is projected to be 2-story, offer underground parking, and will be twice the size of the current building, while occupying roughly the same footprint in the park as its predecessor, though as of this writing, the funding mechanism is unclear. 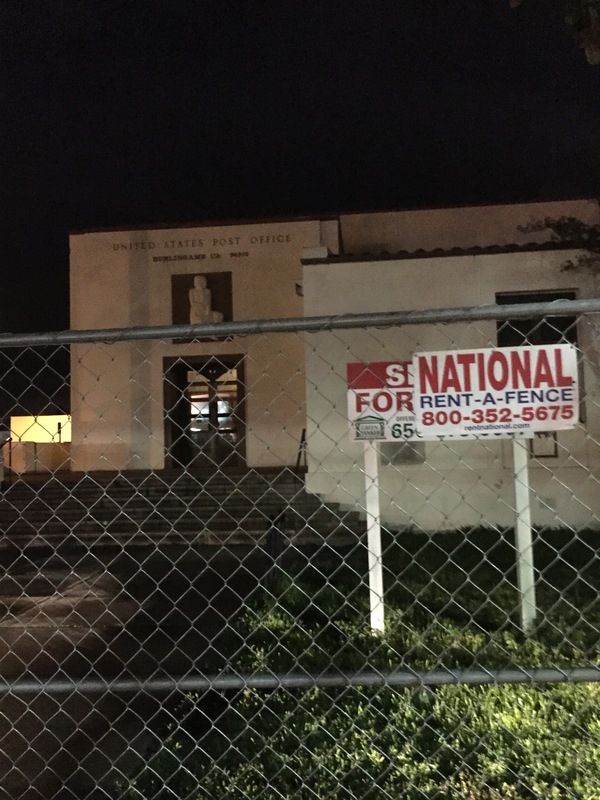 After several years of speculation, the 1941 USPO structure on Park Road was sold late last year to a local party for just under $16 million. A much smaller USPO facility has opened in a vintage structure at 329 Primrose Road, just a stone’s throw from yet another very early post office location, one of several in Burlingame before the Park Road structure was built. It remains to be seen what the purchaser has planned, but the property has been fully cyclone fenced and is being offered for short-term lease for the sum of $50,000 per month. The area as of 2010 has been zoned for civic, residential, retail and office uses (or a combination thereof). 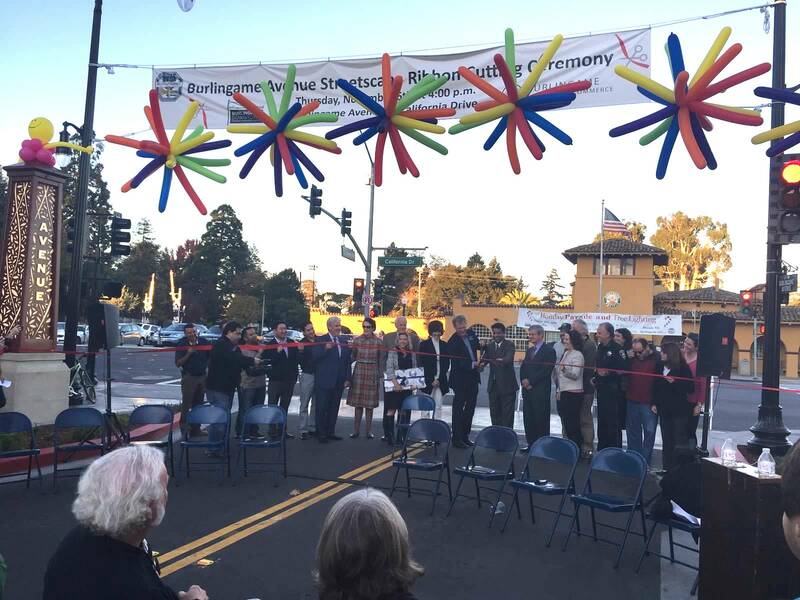 This is just around the corner from the beautiful, newly completed Burlingame Avenue Streetscape that took many years of planning, followed by roughly two years of major construction, both above and below ground. The resulting project successfully creates a “sense of place” by blending a variety of new materials, and features a number of vintage ones from earlier iterations of the Avenue. 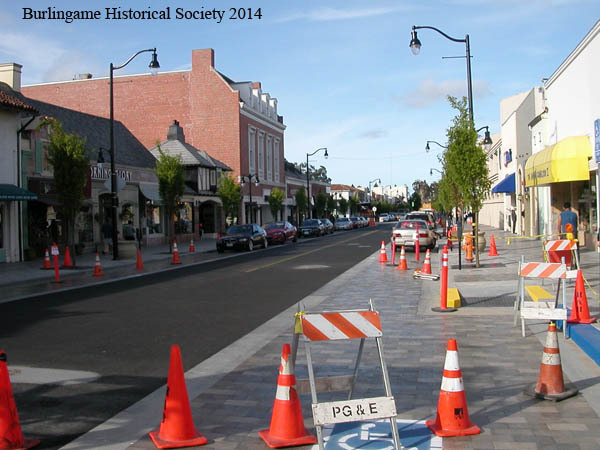 Parking has always driven Burlingame development. 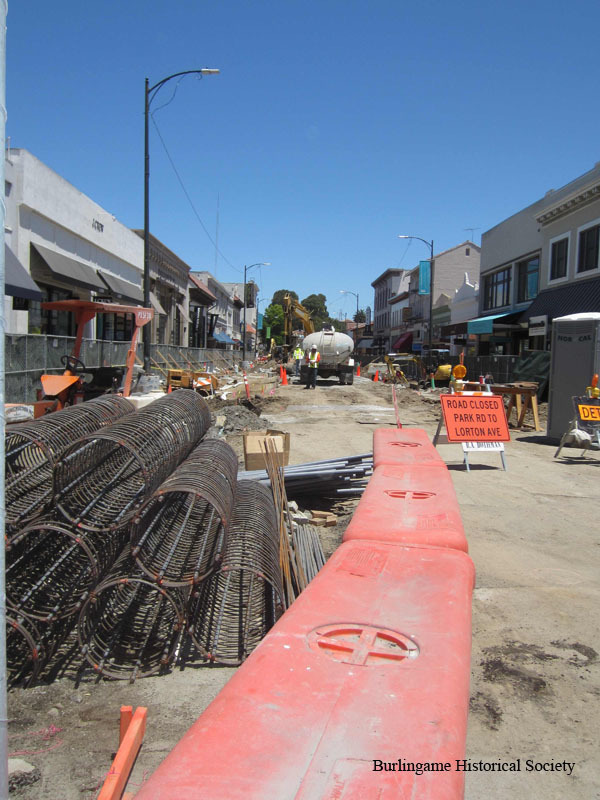 Four years after a major revamp of Burlingame’s downtown zoning, including most notably, the downgrading of parking requirements, the area may be seeing the first realization of a multistory residential structure south of Howard Avenue since the 1980s. In March, the first public meetings took place regarding three potential concepts of a public-private partnership involving the use of two city-owned surface parking lots. Each proposal involves full or partial “attainable” housing units, combined with a new parking facility. The process will be ongoing and most certainly controversial, as the first such project of its type in our city. 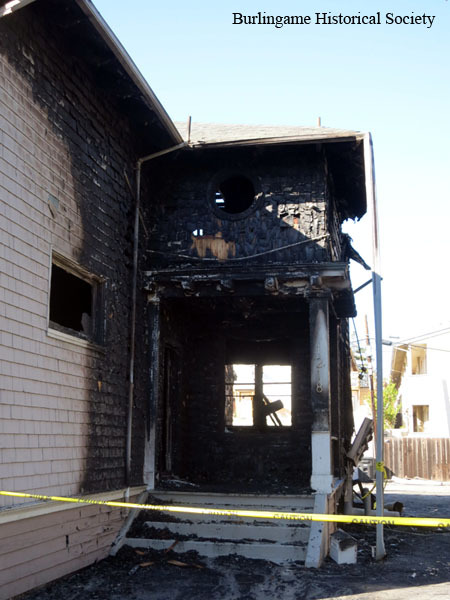 An early morning fire on Donnelly Avenue in November 2013 resulted in significant damage to two of three homes on Donnelly Avenue, one being the George W. Gates pioneer home. All three homes were formerly located on Burlingame Avenue a century ago. Fortunately, no one was hurt. Fire seems to dog the Gates family. On Christmas Day in 1990, the former Gates Garden Theater on Burlingame Avenue, burned down in an act of arson. The large structure, with rear access on Donnelly, dated from 1918, and had been used for decades for various retail establishments. Since the damage to the Gates’ home is fairly extensive, it is likely that the current owner will demolish all three structures, though as of this writing, it is not known what type of structure will replace them, though it will most certainly involve more intensive use of the valuable property. 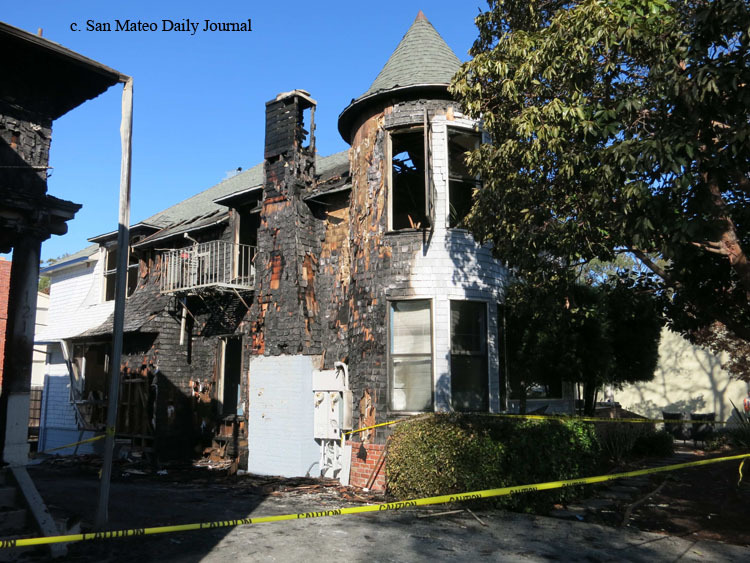 We are very sorry to see one of Burlingame’s last remaining pioneer homes likely lost. We continue to receive calls from exasperated residents about older residences being torn down in favor of new, significantly larger structures. 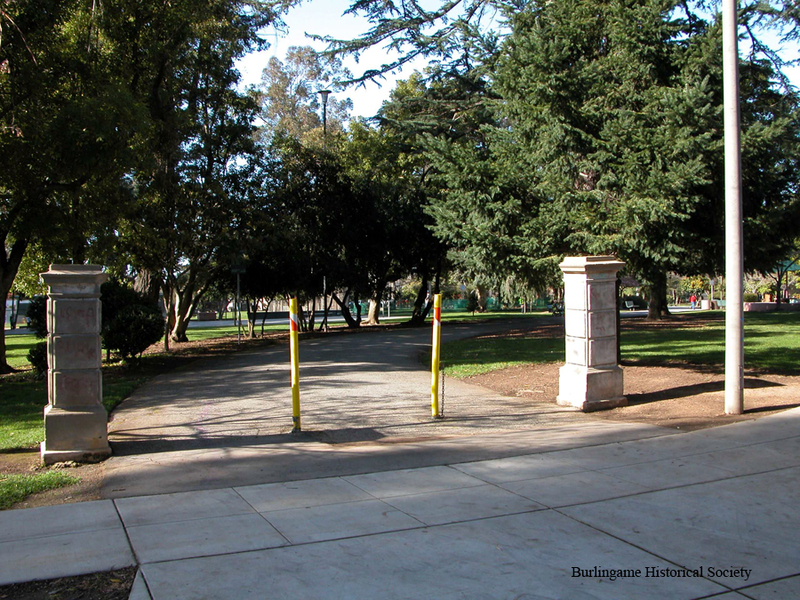 Only those structures located in the Burlingame Park Subdivisions 1, 2 and 3 have (thus far) been determined to have potential historic significance. As such, it is a requirement of the Planning process to obtain a professional historical assessment in advance of demolition or major reconstruction. Additionally a historic properties ordinance of very limited scope (downtown proper) was passed in the summer of 2014, to offer benefits to properties determined to have historical significance. Thus far, from fewer than two dozen eligible properties, no applications have been submitted to benefit from the Mills Act or other tax or building code benefits. Since the 1980s, the Historical Society has suggested the funding of a professional citywide survey of historic structures; thus far, this has not been seriously considered. Tall buildings have always had their foes in Burlingame, but in an interesting twist, a developer has proposed moving and restoring the historic James R. and Jessie Murphy residence, located at 1128 Douglas Avenue, to a new location on Oak Grove, east of the railroad tracks. The Murphy family lived their entire lives in this home, and played significant role in Burlingame history from the time of its incorporation. A new, multi-unit apartment structure has been proposed in its stead, Douglas Avenue having been zoned for tall, multi-unit residential housing since the 1960s. To our knowledge, this is the first home to be moved in many decades, and the second time this particular home has been moved. 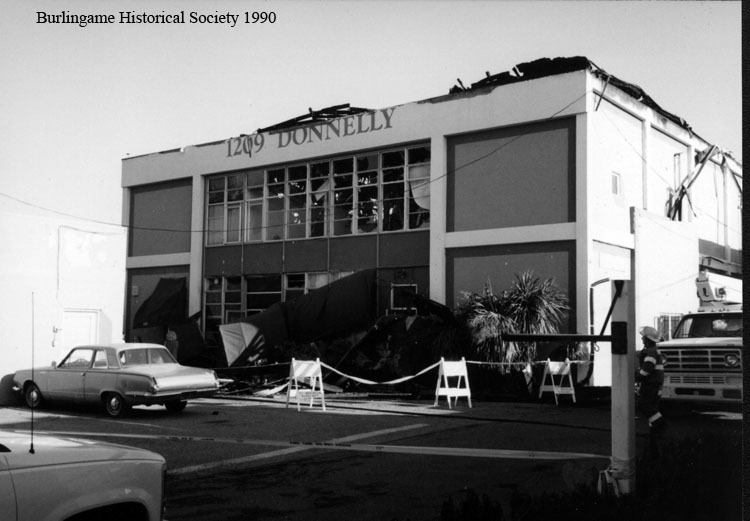 The first instance was in 1914, when the 1903 pioneer structure was carted off to the large lot on Douglas Avenue to make room for the burgeoning business district on Burlingame Avenue. So, on a positive note, we are thrilled that the historic significance of the pioneer Murphy family will continue into the future. Finally, and significantly, the City of Burlingame will soon begin updating its circa 1969 General Plan, a plan that has arguably served us quite well over the years. The revision will take a couple of years, and cover all aspects of Burlingame planning; specifically it will establish a road map for the land use and zoning of our city into the future. Burlingame residents have never been shy speaking up when unhappy. Indeed, this is a big reason why Burlingame has always been different (dare I say, better?). In an era where most people are preoccupied with day to day issues, it is more important than ever that people take the time to inform themselves about city issues and get involved, if only to ask questions and/or write a letter. Burlingame residents have never settled for second best and shouldn’t start, now. 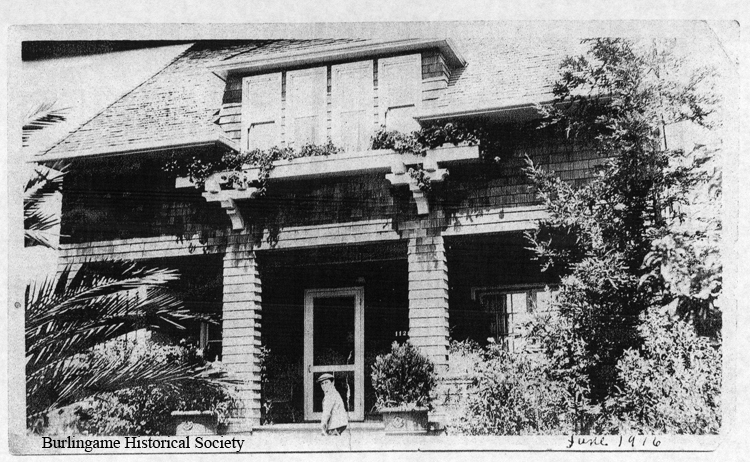 The Burlingame Historical Society will continue documenting our history, the good events and the unhappy ones, just as it has done for forty years.